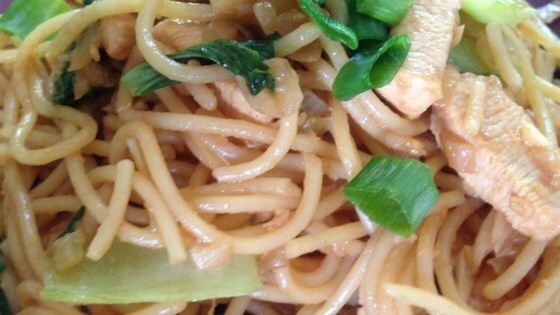 "Try this next time you have a hankering for takeout food. Soon, people may be knocking at your door for the recipe." In a large pot with boiling salted water cook angel hair pasta until al dente. Drain. Meanwhile, in a large nonstick skillet heat canola and sesame oil over medium high heat. Saute onion and garlic until softened. Stir in chopped chicken, and cook until chicken browns and juices run clear. Stir in ginger, bok choy, chicken stock, sherry, soy sauce, and hoisin sauce. Reduce heat, and continue cooking for 10 minutes. Toss pasta with chicken mixture until well coated. Season with salt. Serve warm sprinkled with minced green onions. Try this recipe for an Asian-inspired marinated chicken! Easy. I altered a bit needs color. Added mushrooms, red bell pepper and baby corn. also more chicken and sauce. Stunning... however I do find that adding a bit more hoi-sin sauce and soy sauce make the flavour quite a bit stronger.